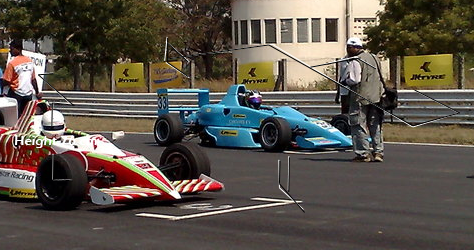 Madras Motor Sports Club is an Indian auto racing club founded in 1952 and based in Chennai, India. Madras Motor Sports Club with its history of over 50 years is the reason that Chennai can be called the epicentre of motor racing in India. For a racing enthusiast, there is nothing to beat the smell of burnt rubber and the sound of screaming engines...and what better place than the Irungattukottai Race Track to catch the racing excitement. 954, MMSC was founded but the first president was G. M. Donner. K. Varugis became the Hon. Secretary and Rex Strong was just one of the Committee member. Regional auto racing had been held at Sholavaram Airstrip since October 25, 1953. Since 1954, racers and organizers had been having dinner in MMSC after race meeting in Sholavaram. MMSC used to hosted the Mopeds, Scooters, Superbikes and Indian Saloon car racing, in addition to other top-level auto racing series like 1981 Formula One, Formula 5000, Formula Two and Formula Atlantic at Sholavaram. Recently, MMSC has all their race meetings in Irungattukottai, Sriperumbadur, Chennai. The Madras Motor Sports Club is owning and operating the Irungattukottai Race Track in Irungattukottai, Sriperumbadur, Chennai.